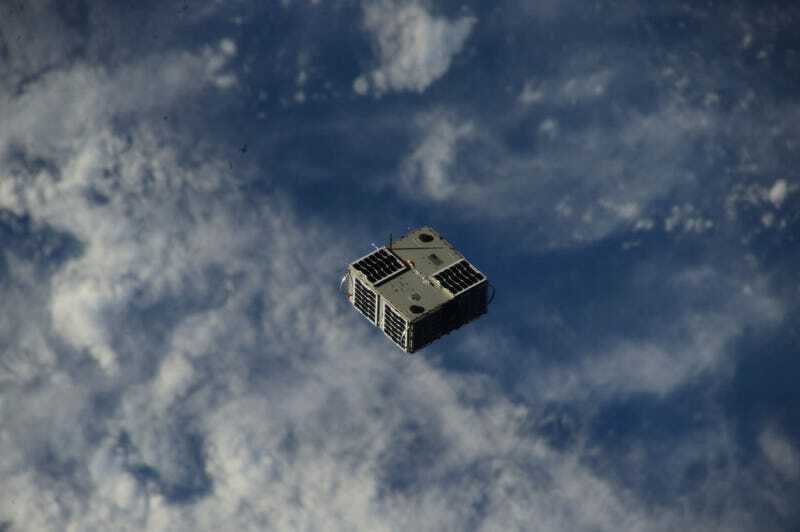 Astronauts fired this small, rectangular hunk from the International Space Station yesterday. The payload will separate into two autonomous satellites as part of a research programme to take us one tiny step closer towards making asteroid mining a reality. If we ever want to mine asteroids, we’re going to need to step up our game for multiple satellites sharing data and working together. A pair of Texan universities are working together on a four-mission sequence to create a pair of robots that can autonomously rendezvous and dock in space. The project is called Low Earth Orbiting Navigation Experiment for Spacecraft Testing Autonomous Rendezvous and Docking — or Lonestar if you ignore the D.
Lonestar is actually two satellites disguised as one—AggieSat4 built at Texas A&M University, and BEVO-2 built at University of Texas. AggieSat4 is the bigger satellite, and will spit out BEVO-2 once the pair are in their own orbit free of the station. They’ll be testing communications and positioning. Once separated, they’ll cross-link their communications and start swapping data. Each will hook into existing GPS networks to determine their locations, then start up a transmission to ground radio stations. This will improve our understanding of cross-linking communications between satellites and ground control. The mission will also improve our understanding of how well the global positioning system works in orbit, which is part of a bigger problem on how to efficiently navigate in deep space.